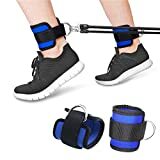 Made with high-grade nylon and thick padding,the adjustable Velcro strap makes it suitable for use around ankle.Which give you premium comfort and stability, while aslo properly securing weights. Improve your calf, leg and lower body technique with secure. Ankle strap can improve your strength of leg and lower body and enjoy bigger gains and sustained workout routines at the gym. Ankle straps improve long term stability. Our ankle strap cable attachment boasts a wide Velcro design, double stitching and reinforced steel double D-Ring to reduce stress, wear and tear. A pair of two ankle straps to broaden your range of workouts, you can used with Cable Systems, Resistance trainers, Functional Trainer etc for leg extensions, leg curls, and hip abductors. Designed to fit men and women, our cuffs are not only a better buy, but will stay with you workout after workout, keeping you motivated, trim, and tone in all the right places. This is D-Ring Ankle Strap. Outstanding comfort Lined with shock-absorbent padding. The adjustable Velcro strap makes it suitable for use around ankle.